In 2015, at the age of 31, I moved from Minneapolis, Minnesota, to San Francisco, California. It felt like I had shaved five years off my life. In Minneapolis, as far as I could tell, the majority of people around my age were either married or close to getting married, and many of them already had kids. In San Francisco, very few of the people I met were even in serious relationships. But people’s instincts about demographics are often wrong. Perhaps it was just my socioeconomic stratum or the luck of the draw in terms of the people I happened to meet. It turns out the difference wasn’t just in my head. 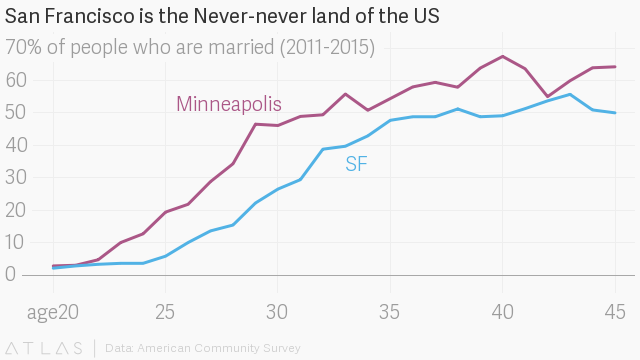 A Quartz analysis of US Census data from 2011 to 2015, shows that San Franciscans typically lag behind their counterparts in Minneapolis by about five years in likelihood to be married. While around 46% of people in Minneapolis are married at age 30, less than 27% of 30-year-olds in San Francisco are married. It is not until age 35 that the proportion of married people in San Francisco reaches 46%. San Francisco is not only unusual in comparison to Minneapolis. Among the 100 most populous counties in the US, San Francisco County, which is made up entirely of the city of San Francisco, is the county in which Americans are least likely to be married between the ages of 28 to 32. The only place where marriage is less likely for this group is Washington DC (technically not a county). The following table shows the ten counties or districts in which marriage rates are lowest among 28 to 32-year-olds. The estimates are based on a sample, so are inexact, but they are likely accurate to within 1.5 percentage points. For context, the overall rate of marriage for this age group in the US is about 45%. This list is made up of two types of places. One, coastal cities where young people have relatively high incomes and high levels of education like Washington DC, San Francisco, and Suffolk County (Boston and some of its suburbs). Those who make more money and spend more time in school often delay marriage until their mid- to late-30s. Two, cities with a large proportion of African Americans, like Baltimore, Prince Georges County (a suburb of Washington DC), and Wayne County (Detroit and some of its suburbs). African American marriage rates are about 25% lower than the rest of the US population. In contrast, the 10 large counties where people are most likely to be married tend to be suburban counties in the middle of the country. With almost three-quarters of its 28 to 32-year-olds married, Utah County, a suburb of Salt Lake City, is the place with by far the highest proportion of young people that are married. The higher probability of young people in the suburbs being married is not surprising. When young people couple up, they often look for areas with good schools and affordable housing to raise a family. Usually, that is found in the suburbs of major cities. Although they might not realize it, this is the future for many of those unmarried 30-year-olds in Washington DC and San Francisco.